TITLE: I Don't Know About Art But I Know What I Like: The Sequel! Alex Osamuyi is your everyday run-of-the-mill "419" scammer. He contacted me a few weeks ago with the usual "$30 million to deposit into your account, yada yada yada...", but I replied back to him as Derek Trotter of Trotter's Fine Arts dealership to say I wasn't interested in his deal. Alex never replied to that email, but sat back for a week or two to have a think. He had the smart idea to change his name and his email address and contact me again claiming to be another Art Foundation offering artwork.... at a price of course. Is this a first? Do we really have a smart scammer on our hands at last? I think we all know that answer to that one my friends! Subject: Your Support Is Needed!!! Fine Art, Keeping Memories Alive. Love this tagline Alex, nice work! Greetings to whom it may concern. We are non governmental organisation recide in some parts of Africa to be precides, "Nigeria". We are into artistic work such as drawing and painting e.t.c. Our organization name is: OSAMUYI ART WORLD FOUNDATION. To our best of knowledge, African are people of historical fact and we strongly believe that history is not just an history, But still lives and breath today because of the artwork that we see everyday. A very noble statement Alex. Our main objectives of setting up this organization is to create job opportunities for the youths and make them deviate from violent, fraudulent and criminal acts. In our latest resarch, we found out that the youths can only be idle when they have nothing doing. But since our organization set up this foundation of employing perfect artist into our artworld foundation and giving artistic training to our youths who hardly take in a square meal a day, most of them can now afford three square meals a day. Not relenting, our good art work had made us second to non in Nigeria. But, without international support, we'll do little or nothing. For the past few years, we've been doing a lot of good work for international companies who are into art work as well. This is how we operate; you send us the sample of the picture you want us to draw or paint for you or your company, then you'll pay us some money in advance to multivate (?) our artist. Then, after finishing your work, we'll either scan it and send it to you via your e-mail address or we'll ship it to you, through courier service, depending on how much you or your company are willing to help us with, to enable us to complete our new site, which is the most reason why will seek for your help. Astounding! Almost exactly the way Trotter likes to work. If you are willing to offer us a job or a donation, which will go a long way in completing our new site. Please contact us through this E-mail address: [email protected] or call: +234-802877xxxx. We'll be glad to recieving a helping hand from you. On behalf of my board members, thank you very much for your time and understanding. And must of all, we wish you success in all your endeavours. Thanks once again and God bless!. So as you can see, Derek Trotter has struck it extremely lucky here. Here's a guy who shares our philosophy word for word. It's almost as though we have given Alex information about us before. Spooky! Derek can't pass on a great opportunity like this, but pay cash in advance? No, we're not going for that one Alex. Thank you very much for your email, and may I say you are very fortunate to have contacted me. 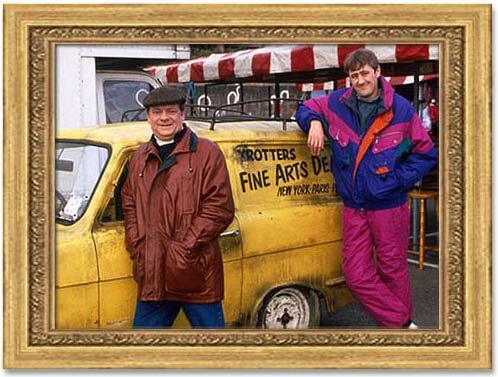 My name is Derek Trotter and I am the director of Trotter's Fine Art Dealership here in the UK. My company do in fact offer scholarships and donations to young and old artists alike, and we are always looking for African/Ethnic art to sell or promote here in the UK. I must say I admire the work you are trying to do, and to help young artists both financially and spiritually is a very noble cause and I wish you very much luck with your project. We are dealers in fine art and ethnic art from all over the world and we supply many business and private customers. We also offer scholarship donations to aid up and coming new artists who may otherwise not have the financial means to be able to produce or improve their work. Our scholarship payments range from between $20,000 and $150,000 depending on the potential of the artist. As we will see soon, my minimum payment amount is rather flexible! We would indeed be very interested in helping to sponsor or send a donation to your artists in return for samples of their artwork, however we do not under any circumstances pay money in advance of receiving specimen artwork, this is not our company policy. Before we are prepared to send any monetary donations, we would require your artist (or artists) to provide us with a sample of their work, in the form of some artwork specifically ordered by us. We supply you with a sample image that your artists must reproduce in their own hand. On receipt of the artwork we would then consider a donation or sponsorship equal to the minimum amount of $20,000 depending on the quality of the work. If you are willing to accept the above conditions then I am sure my company can help you, if not then I wish you good luck in your endeavour and I hope you find another benefactor. So, Alex isn't going to get any kind of upfront payment. Will that deter him? You all know the answer to that! I must say; thank you first of all. We received the mail you sent us, and we assure your company the best of African Art. Meanwhile, we need the sample of the work to be drawn or paint for your company, so we can get down to business. Our boys are ready to do anything as it concerns Art Work. Please, we await the sample of the picture. And mind you, consider anything well done while your work is in the hands of: Osamuyi Art World Foundation We don't charge much, but you'll be the one to decide how much you're going to pay for a start. provided is a good start. Mr. Derek, on behalf of my board members, i must say; thank you very much, and we await your swift reply. May God bless you, your company and your family. Amen! OK, now we need to get a sample image sent to Alex. My apologies for the small delay in replying to you delay, however we do have a lot of applicants to process and this is causing some delay in our replies. Please note the reference number above. This is the reference number which will be included on any future payments to you as well as all correspondence. Please ensure you always quote this number on all future correspondence so that we can deal with your emails more efficiently. 1. The MINIMUM completed picture size must be 14 by 14 inches, however as long as they are bigger than this they can be any size your artists prefers. 3. The painting/drawing must be the artists own work by hand and NOT traced in any way. Attention to detail is extremely important and will help my board members to judge the skill of the artists. You will see that the attached picture has many small details. Ensure your artist is made aware that he must attempt to capture as much detail as possible. You may tell your artist that the picture can be painted on any type of surface, such as paper or canvas. Please bear in mind that the artwork will have to be shipped to us for inspection before the donation payment is given, so obviously you must take into consideration the weight of the artwork so that the shipping cost is not too high for you. On receipt of satisfactory artwork we will then judge the skill level of the artists submission and will reward him/her with a monetary donation depending of their skill. As mentioned previously, the minimum donation amount per artist is $20,000 but this can rise up to $150,000 per artist depending on their skill. Note that my board members will usually pay higher amounts for paintings rather than drawings. Donation payments are usually given within 24 hours of receiving the artwork. Please note that your shipping charges will also be refunded in full, however we can only refund shipping charged AFTER we receive the artwork. If you have any further questions at all please do not hesitate to get back in contact with me. Also, please let me know when you expect to have the artwork ready for shipping. I enclose the picture for the artist to duplicate. 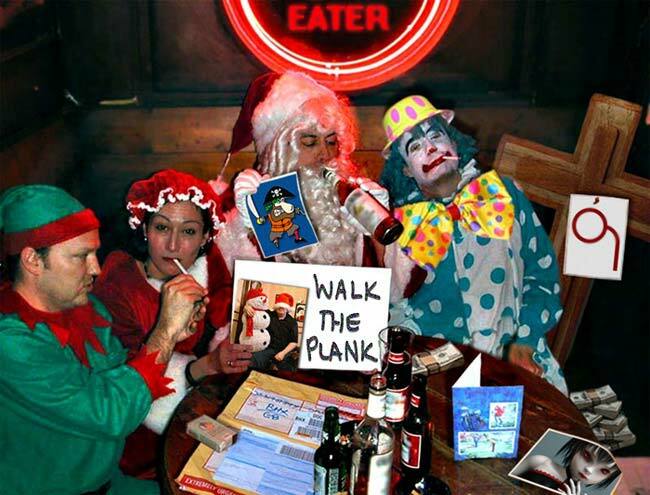 Many of you will of course recognise the bulk of the picture from the Prince Joe Eboh scambait, but I have re-edited the picture slightly to include a new message, and extra pictures have been added which include a couple of the avatars I use on the 419eater.com forum. 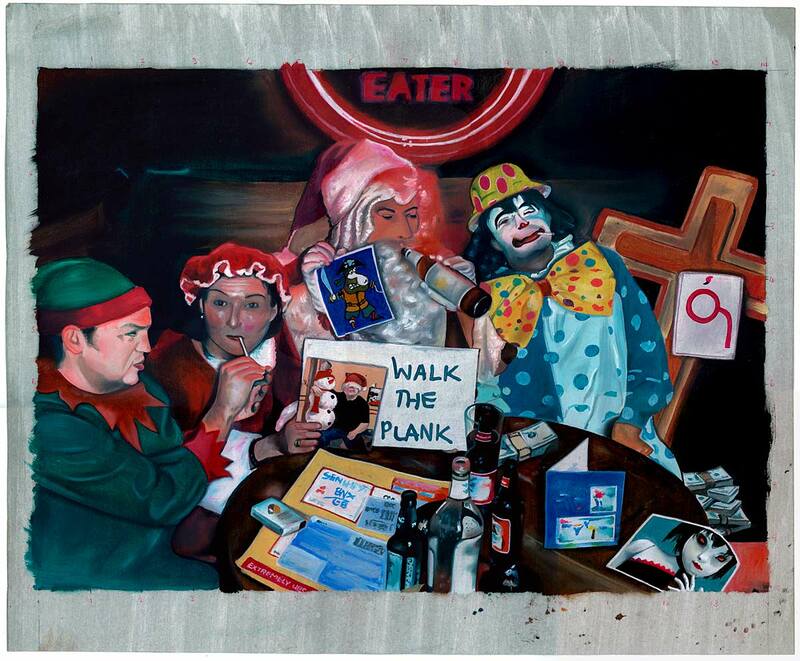 I've also added the word "Eater" to the clock, a picture of me with a snowman on my knee, and also the logo of the Painted Breast Church - lets just hope Alex hasn't read The Tale of The Painted Breast! My boys have already rolled up their sleeves, to make sure you have the very best of art work in Africa. I and my board members have already inspected the sample of the picture you sent us. We do not charge much because we always look forward to receiving a greater job from all our costumers. Meanwhile, Mr. Derek, i must asure you that our boys have been trained over time for this work, and they do no such thing like TRACED WORK. But, before we emback on any job, our client will have to tell us how much he/she is willing to pay for a start. Mind you, it's not a task, you can aswell pay 5% of the money before you can have a view of our perfected job. Alex is again trying to screw me for some cash up front, but that's not something Derek Trotter will even consider. We raised this idea because we've experience a lot of distrust lately. But, i'm not saying you're one of those who likes to take people's sweat for granted. Please, bear with us. NOTE: Your work will start as soon as we receive your reply to this mail, and i promise to inspect and treat your work with utmost delegency. Bye for now and have a blissful day ahead.. Lets put a stop to all this cash up front crap right now. Please tell your artist to stop any work immediately. I am afraid that my company does not pay any fees in advance, no matter how small. I am afraid that it seems that at this time we are unable to help you as we are not prepared to pay a 5% fee up front. Thank you for your time, and I wish you luck finding other customer. I am sorry we could not help each other at this time. Will Alex decide this is the end? Will he stand for my demands? Will he refuse to work for me for nothing up front? Your last mail was quite breath taking. I must let you know that; we've never gone beyond the rules of our organization. But, it's interesting to know that, you are such a geniue person. Meanwhile, we've decided to adjust to your own policy and with all manner of trust we've accepted it the way you want it. Nice one Alex. You're a real gent! Mr. Derek, i hope it wasn't an eye opener to you when you read the mail, i.e when we requested for the advanced payment, was it? We've experienced a lot of distrust lately that was why we brought up that idea. Well, we're proud to letting you know that; You'll be glad you do business with us and we promise you the very best of African Art Work. Sir, we'll continue your work immediately, have a nice day. You can rest assured that should your artist be able to produce work to an acceptable level that your payment will be forthcoming within 24 hours of us receiving your work. Please understand that my company is not in the business of trying to deceive people, if we did that we would very quickly be out of business. We have a very valuable reputation to uphold and we would certainly never do anything that would tarnish such a reputation. Our customers are mainly very wealthy and influential people, and we would very quickly lose them if we were to act in an unprofessional or dishonest manner. I am glad that you have decided to submit some work to us. Please can you advise me when you can expect to have the artwork ready for shipping? We're glad to inform you that; Your work will be done with all manner of deligency. When we are done, we shall ask for your contact address, for the shipping. Don't bother for now, we are doing it deligently. Sir, i want you to please, exercise a little patience, because your work is a bit technical and we need to seriousely deal with it, because the technicality ought to be seen in us aswell. Our organization still wants to keep her reputation, that's why when we are given a job, We do it with all manner of deligency, It's very important. Please, give us a week ahead to make sure we give you the very best of art work. It's going to be on coloured painting and not the less. We'll appreciate it, if you understand. Thank you Sir, and may God bless you and your family at large. Lets try to hurry things along a little. Thank you for your previous email. However, please note that I am flying to Singapore on Tuesday the 25th of October, and I will be away for approximately 6 weeks. If you require your payment before this date then you will need to get the artwork to me for my board members to inspect by the very latest date of October 24. I am personally not in any great rush to see the work myself, but if you leave it any later than this date then it will be at least the middle of December before we can process your case. Thanks a great deal, Sir. It's good to know that, you are not in a hurry to seeing the work aswell. But all thesame, i promise you latest on the 22-23rd, we shall present our work. Sir, you know that such work shouldn't be done in a hurry, Sir. Though, we are almost done. Sir, you're going to be amazed by what you'll be seeing, it's a promise. Meanwhile, Sir, i think we need your direct contact address now, because, we'll be done soon. Thanks for your patience, and God bless. Note, we await your contact address for the shipping. Thank you for your quick reply, it is very much appreciated. I do look forward to receiving the artwork, and I will of course contact you immediately that it arrives. Do you know what size the picture is going to be? Please ensure the package is addressed exactly as above so that my secretary will know it is for my immediate attention. As previously requested, please let me know the tracking number of the package and the expected delivery date so I can ensure everything is ready for quick processing of your payment etc. Preferred delivery method is by FedEx or DHL but you may use whatever shipping company you wish as of course I have no experience of delivery companies in your country. Well I do, but I need Alex to think I'm clueless. I need him to think he is getting one over on me. Thank you again for keeping me updated. The work will be shipped to the address as directed by you, When it's ready. The size of the work is made 14 by 14 inches, as demanded by you. Damn. I thought they might at least attempt a bigger one! Thanks, Sir, for your support, We love you. Alex loves me. I suspect this declaration of love will be relinquished pretty soon and replaced with a rather more harsher expression of his feelings. I don't bother to reply to Alex this time. I don't like to interfere with an artist at work. The shipping date will have to be tomorrow or next by the grace of God. Sir, i hope you weren't angry for me, for not writting you for the past few days now, If my quess is as good as your, then, i'll say thank you. Bye for now, and i look forward to hearing from you today. Once again, thanks for your golden patient. Thank you for your email, and I am pleased to learn that the artwork is now ready. I appreciate the time and careful effort you have gone into to ensure the artwork is completed correctly. Please inform me of the tracking number as soon as you have shipped the item and of course I will contact you immediately that the artwork arrives. We should be able to process your payment very quickly and within 24 hours of your artwork arriving with us. How has the day been? I quess splendid. Meanwhile, we've finally posted your fine art work to you! Sir, it was supposed to be posted yesterday, but the weather condition here, wasn't okay, it was raining heavily all day long. Lest i forget, it was posted through: FEDEX, to the exact address as givened by you. Here is the tracking number: 85303452xxxx and the commodity description is; FINE ART WORK. It will be arriving on saturday. But, you will be receiving it on monday. NAMES: SOLOMON ENOFE, WILSON IDOWU. STATE: EDO STATE, BENIN CITY. Sir, the reason why i gave the two names is because; WESTERN UNION in Nigeria, do not allow nothing more than $5,000 USD, because of the tight monetary system here. Sir, we'll be glad to receiving a great donation from you. In addition, my artists names that did your work Sir, are by the names: Frank Enofe and Omobude Osakpamwan, you'll be amazed at the work done here by them, they are my senior boys. We sincerely thank you for this wonderful gesture of yours, and we wish to continue serving your company. My humble regards to you and your board members, God bless. I am glad to learn that the artwork has now been shipped and I look forward to viewing it. I shall advise my board members to be ready to look over it immediately that it arrives. Thank you also for the payment information, and this has now been added to your case files. Again I will contact you immediately that your artwork arrives. Please can you confirm to me your telephone number that I can contact you on once the work arrives? My best greetings to you, Sir. I must say; we glad in and out to know have known you. Honestly, we are! Here is my personal mobile number: +234 802877xxxx. It will be my greatest pleasure to hear your voice, Sir. Sir, i'm broud to letting you know that; when you receive the package, you'll find it to be proberbly the best or one of the best painting work ever seen by you. Because, it's one of the best painting work ever done by us as well. Meanwhile, i'll pass your thanks to Frank and Osakpamwan my senior boys. They'll be glad to hear that, Sir. We expect your huge reward and the praise thereof. Bye for now, and i will be expecting your call. Well, this artwork is being built up to be a small masterpiece. I wonder if I will think the same when it arrives? I'm certainly excited after reading such a great write up! A quick check on the FedEx tracking site does indeed show it is on the way, and is due to arrive Monday morning. Monday arrives, and what do you know; the picture arrived by FedEx as promised. 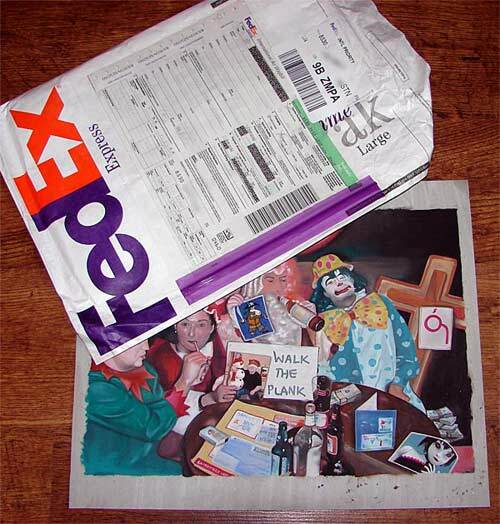 Shipping charge to Alex was US $45 plus whatever he paid the artist to paint the picture. Actually it is not a bad effort at all. The picture is painted into a thick textured paper with a fairly thick layer of paint and measures approximately 14 by 16 inches. I'm no art expert (really!) but a fair degree of skill seems to have gone into creating this picture. Note the digits around the edges of the painting. I'm no artist so I don't know what they are for, though I suspect the artist probably drew some kind of grid underneath the painting to aid positioning etc. Below is a picture of the FedEx packaging along with the picture again. Sadly Alex decided to fold the picture instead of packing it into an envelope the same size! Alex has done well (or rather the artist he got to paint the picture), so I will write to congratulate him shortly! I am happy to inform you that your artwork has been received by my secretary who contacted me just a few minutes ago. I will be inspecting it later this afternoon. Also the good news is that I will not now be needed in Singapore as one of my assistants will be going in my place so I will be able to personally attend to your case. All that remains before we can decide on your donation payment if for you to complete the attached release and security forms. They are very simple and you should have no problems completing them. Once they have been completed, please scan them to a high quality and return them to my by email attachment. It is important that the returned scans are large and clear as my board members will not accept unclear paperwork. Once the forms have been received we can then move on to your payment. Please complete sections 1 to 4 yourself. The artist himself is to complete section 5 "Artist Release Form". These are standard forms we send out, and some of the questions are required by law to ensure no funding is given to any kind of terrorist organisation. The Psychological/Morality test is a simple test to ensure that if we ever intend to invite you or your artist over to the UK that you are of sound and stable mind. As soon as the forms are returned and my board members havae checked your artwork then your payment will be calculated and sent to you as soon as possible. Alex duly returns the completed forms. They were pretty washed out so I had to touch them up a little in Photoshop. How are you today, i quess nice and splendid as usual? Meanwhile, the form has been filled and it is attached to this message underneath. But, i just did all i could. The most confussing aspect of it all was (3b) of section 3. In additoin, the section 5 was filled by my senior boy Enofe Frank only. But, the work was done by a combination of two. And when i crossed checked what he wrote regarding the form, i could see some words from his heart. Well, i think you just have to do something about that if there anyway you could. We await your donation payment, please, note: The payment should be made to the address as directed ealier in my previous mail. Section 2 - 2f: Seems Alex has been convicted of having a perm?! Section 3 - 3a: Alex likes to caravan. With respect to all you caravan owners out there, this is mark against Alex! Section 5 - 5c: Amazingly enough, the artist and Alex seem to share the exact same handwriting. I wrote to you yesterday to thank you for sending the completed forms but I received no reply, however to repeat myself, the donation amount will be revealed to you later this afternoon, and the payment will hopefully be made to you later the same day or early tomorrow morning. I will be meeting with my board members shortly and your donation amount will be discussed and calculated. In the meantime I am happy to present you with your Completion Certificate. Unfortunately the office scanner does not seem to be working properly I had to take a photograph of it rather than send you a clear scan. The certificate will be posted to you later this afternoon and hopefully you will receive it early next week. 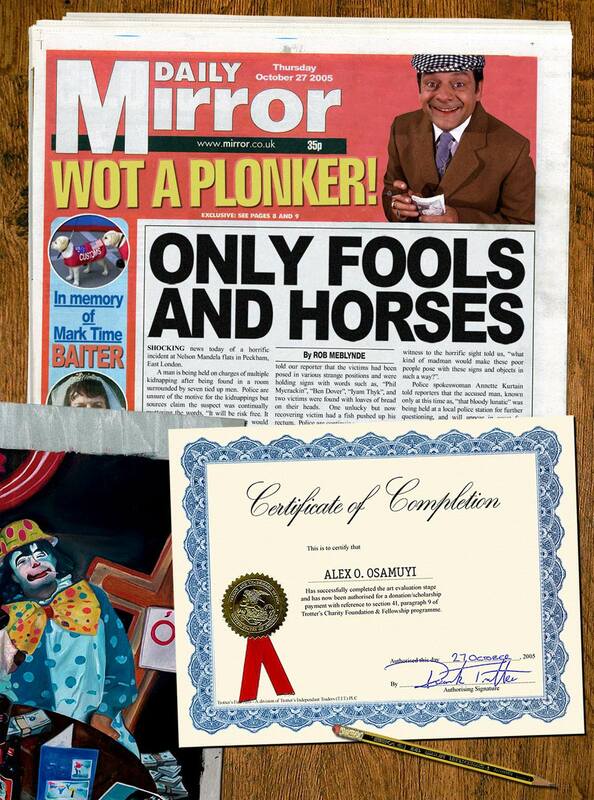 I send Alex a "photograph" of his award certificate which is in fact a Photoshopped image. Nothing in it other than Alex's painting actually exists in the real world.